Log Horizon (Japanese: ログ・ホライズン, Hepburn: Rogu Horaizun) is a Japanese novel series written by Mamare Touno and illustrated by Kazuhiro Hara. It began serialization online in 2010 on the user-generated novel publishing website Shōsetsuka ni Narō, being later on acquired by Enterbrain and published in Light Novel in Japan since 2011. Yen Press began publishing an English translation in 2015. The series follows the strategist, Shiroe, and the other players of the long-lived MMORPG Elder Tale after they find themselves whisked away into the game world following a game update. The novel has received four manga adaptations, with one based on the main story and the other three revolving around characters in the series. An anime adaptation aired on NHK Educational TV between October 5, 2013 and March 22, 2014. A second season aired between October 4, 2014 and March 28, 2015. By its eleventh expansion pack, the massively multiplayer online role-playing game (MMORPG) Elder Tale (エルダー・テイル, Erudā Teiru) has become a global success, with a user base of millions of players. However, during the release of its twelfth expansion pack: Homesteading the Noosphere (ノウアスフィアの開墾, Nōasufia no Kaikon, sometimes mistranslated as Novasphere Pioneers), thirty thousand Japanese gamers who are logged on at the time of the update suddenly find themselves transported into the virtual game world and donning their in-game avatars. In the midst of the event, a socially awkward gamer named Shiroe, along with his friends, Naotsugu and Akatsuki, decide to team up so that they may face this world, which unfortunately has now become their reality, along with the challenges and obstacles ahead of them. Log Horizon began as a light novel written by Mamare Touno. It initially appeared in installments on the user-generated content site Shōsetsuka ni Narō ("So You Want to be a Novelist") starting on April 13, 2010 and subsequently published in book form by Enterbrain since March 2011. Yen Press obtained the rights on its light novel imprint to release the novels in English from 2015. Several additional volumes have been released as web-novels. The novel series has received four manga adaptations, all written by Mamare Touno. The first adaptation is illustrated by Motoya Matsu and titled, Log Horizon Gaiden: Honey Moon Logs. It began serialization on January 27, 2012, and is published by ASCII Media Works in the Dengeki Daioh magazine. The second adaptation is illustrated by Kazuhiro Hara and titled Log Horizon. It began serialization on May 18, 2012, and is published by Enterbrain in the Famitsu Comic Clear web magazine. Yen Press obtained this manga for an English release. The third adaptation is illustrated by Koyuki and titled, Log Horizon: The West Wind Brigade. It began serialization on July 9, 2012, ended on March 9, 2018, and was published by Fujimi Shobo in the Age Premium magazine. Another manga illustrated by Sōchū and titled, Log Horizon Gaiden: Nyanta-honcho Shiawase no Recipe began serialization on December 21, 2012, ended on March 31, 2018 and was published by Enterbrain in the Comic B's LOG magazine an collected in six volumes. A manga Log Horizon: Kanami, Go! East! illustrated by Kou was serialized in Comic B's LOG from October 1, 2015 to December 1, 2016 and compiled in two volumes. Rebecca Silverman of the Anime News Network noted that the series has "its own unique take on what has become a subgenre of fantasy" when compared to the previous Sword Art Online and the earlier .hack series. With respect to the anime adaptation, Silverman noted that one of the major drawbacks was the artistry. She held the designs of the characters with small regard, calling them "somewhat bland and generic in design, which is a bit of an accomplishment given how many character creation options there apparently are". She used the design of Akatsuki as an example, explaining that the character's beauty has to be constantly reminded to the audience despite the fact that "she's one of the less striking female characters on screen". Another issue Silverman pointed out was the apparent overuse of Naotsugu's perverted nature for comedic relief and finding that for some viewers he may be "line-crossingly obnoxious". Despite these drawbacks, Silverman remarked that the "show shouldn't be dismissed as 'just another ripoff' before giving it a chance" since "it has the potential to expand rather than rehash the basic premise of players trapped in a game". ^ "Log Horizon - Sentai Filmworks". Sentai Filmworks. Retrieved August 18, 2014. ^ "Twitter / marmalade_macro: @Noneuseless ..." (in Japanese). Twitter. Retrieved December 7, 2013. ^ "Yen Press' Light Novel Imprint Adds Log Horizon, No Game No Life, Devil is a Part-timer!". Anime News Network. August 30, 2014. Retrieved September 15, 2014. ^ ログ・ホライズン1 異世界のはじまり (in Japanese). Amazon.co.jp. Retrieved December 3, 2013. ^ "Log Horizon, Vol. 1". Amazon.com. Retrieved October 10, 2014. ^ ログ・ホライズン2 キャメロットの騎士たち (in Japanese). Amazon.co.jp. Retrieved December 3, 2013. ^ "Log Horizon, Vol. 2". Amazon.com. Retrieved March 22, 2015. ^ ログ・ホライズン3 ゲームの終わり（上） (in Japanese). Amazon.co.jp. Retrieved December 3, 2013. ^ "Log Horizon (Novel)". Yen Press. Retrieved August 4, 2015. ^ "Log Horizon, Vol. 3". Amazon.com. Retrieved August 4, 2015. ^ ログ・ホライズン4 ゲームの終わり（下） (in Japanese). Amazon.co.jp. Retrieved December 3, 2013. ^ "Log Horizon, Vol. 4". Yen Press. Retrieved January 26, 2016. ^ ログ・ホライズン5 アキバの街の日曜日 (in Japanese). Amazon.co.jp. Retrieved December 3, 2013. ^ "Log Horizon, Vol. 5". Yen Press. Retrieved May 4, 2016. ^ ログ・ホライズン6 夜明けの迷い子 (in Japanese). Amazon.co.jp. Retrieved December 3, 2013. ^ "Log Horizon, Vol. 6". Yen Press. Retrieved May 4, 2016. ^ ログ・ホライズン7 供贄の黄金 (in Japanese). Amazon.co.jp. Retrieved December 3, 2013. ^ "ログ・ホライズン7 供贄の黄金 【ドラマCD付特装版】" (in Japanese). Amazon.co.jp. Retrieved December 3, 2013. ^ "Log Horizon, Vol. 7". Yen Press. Retrieved April 17, 2017. ^ ログ･ホライズン8 雲雀(ひばり)たちの羽ばたき (in Japanese). Amazon.co.jp. Retrieved September 7, 2014. ^ "ログ・ホライズン 8 雲雀(ひばり)たちの羽ばたき【ドラマCD付特装版】" (in Japanese). Amazon.co.jp. Retrieved September 7, 2014. ^ "Log Horizon, Vol. 8". Yen Press. Retrieved April 17, 2017. ^ ログ・ホライズン9 カナミ、ゴー! イースト! (in Japanese). Amazon.co.jp. Retrieved February 22, 2015. ^ "Log Horizon, Vol. 9". Yen Press. Retrieved May 15, 2017. ^ "ログ・ホライズン10 ノウアスフィアの開墾" (in Japanese). Amazon.co.jp. Retrieved March 27, 2016. ^ "Log Horizon, Vol. 10". Yen Press. Retrieved May 15, 2017. ^ ログ・ホライズン11　クラスティ・タイクーン・ロード. Enterbrain (in Japanese). Retrieved January 29, 2018. ^ "Log Horizon, Vol. 11". Yen Press. Retrieved February 14, 2019. ^ a b "【コミカライズ】「Ｈｏｎｅｙ Ｍｏｏｎ Ｌｏｇｓ」（漫画家:松モトヤ先生） 橙乃ままれ OFFICIAL WEBSITE". mamare.net. Archived from the original on February 11, 2014. Retrieved March 22, 2014. ^ a b "【コミカライズ】「ログ・ホライズン」（漫画家:ハラカズヒロ先生） 橙乃ままれ OFFICIAL WEBSITE". mamare.net. Archived from the original on February 11, 2014. Retrieved March 22, 2014. ^ "Yen Press Clarifies: Kazuhiro Hara's Log Horizon Manga Licensed". Anime News Network. September 15, 2014. Retrieved September 16, 2014. ^ a b "【コミカライズ】「ログ・ホライズン～西風の旅団～」（漫画家：こゆき先生） 橙乃ままれ OFFICIAL WEBSITE". mamare.net. Archived from the original on February 14, 2014. Retrieved March 22, 2014. ^ a b "【コミカイズ】「LOG HORIZON 外伝　-にゃん太班長・幸せのレシピ-」（漫画家・草中先生） 橙乃ままれ OFFICIAL WEBSITE". mamare.net. Archived from the original on February 14, 2014. Retrieved March 22, 2014. ^ "ログ・ホライズン外伝 HoneyMoonLogs 1 (電撃コミックス)". Amazon.co.jp. Retrieved December 3, 2013. ^ "ログ・ホライズン外伝 HoneyMoonLogs 2 (電撃コミックス)". Amazon.co.jp. Retrieved December 3, 2013. ^ "ログ・ホライズン外伝 HoneyMoonLogs (3) (電撃コミックス)". Amazon.co.jp. Retrieved September 27, 2013. ^ "ログ・ホライズン外伝 HoneyMoonLogs (4) (電撃コミックス)". Amazon.co.jp. Retrieved October 9, 2014. ^ "ログ・ホライズン (1) (ファミ通クリアコミックス)". Amazon.co.jp. Retrieved December 3, 2013. ^ "Log Horizon, Vol. 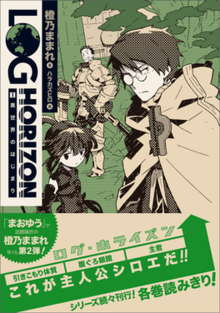 1 (manga) (Log Horizon Manga)". Amazon.com. Retrieved October 10, 2014. ^ "ログ・ホライズン 西風の旅団 1 (ドラゴンコミックスエイジ)". Amazon.co.jp. Retrieved December 3, 2013. ^ "Log Horizon: The West Wind Brigade, Vol. 1". Yen Press. Retrieved May 4, 2016. ^ ログ・ホライズン 西風の旅団 2 (ドラゴンコミックスエイジ こ 3-1-2) (in Japanese). Amazon.co.jp. Retrieved September 9, 2013. ^ "Log Horizon: The West Wind Brigade, Vol. 2". Yen Press. Retrieved May 4, 2016. ^ ログ・ホライズン~西風の旅団~ 3 (ドラゴンコミックスエイジ こ 3-1-3) (in Japanese). Amazon.co.jp. Retrieved October 9, 2014. ^ "Log Horizon: The West Wind Brigade, Vol. 3". Yen Press. Retrieved May 4, 2016. ^ ログ・ホライズン 西風の旅団 (4) (ドラゴンコミックスエイジ) (in Japanese). Amazon.co.jp. Retrieved October 9, 2014. ^ "Log Horizon: The West Wind Brigade, Vol. 4". Yen Press. Retrieved May 4, 2016. ^ "ログ・ホライズン にゃん太班長・幸せのレシピ 1 (B's-LOG COMICS)" (in Japanese). Amazon.co.jp. Retrieved December 3, 2013. ^ "ログ・ホライズン にゃん太班長・幸せのレシピ 2 (B's-LOG COMICS)" (in Japanese). Amazon.co.jp. Retrieved October 9, 2014. ^ "Log Horizon Fantasy Novels Get TV Anime By Satelight". Anime News Network. January 24, 2013. Retrieved October 1, 2013. ^ "Crunchyroll Adds "Log Horizon" to Streaming Anime Lineup". Crunchyroll. October 4, 2013. Retrieved October 5, 2013. ^ ""Log Horizon" Anime Season 2 Airs This Fall". Crunchyroll. March 22, 2014. Retrieved March 22, 2014. ^ ""Log Horizon" Season 2 Gets New Cast and Start Date". Crunchyroll. August 18, 2014. Retrieved August 18, 2014. ^ Green, Scott (August 18, 2014). ""Log Horizon" 2 Listed for 25 Episodes". Crunchyroll. Retrieved September 19, 2014. ^ "Sentai Filmworks Adds Fantasy Game Anime Log Horizon". Anime News Network. Retrieved 7 November 2013. ^ "Sentai Filmworks Licenses Log Horizon 2". Sentai Filmworks. 2014-10-03. ^ "NHK Airs Log Horizon Anime's Opening Sequence". Anime News Network. September 24, 2013. Retrieved September 29, 2013. ^ "NHKアニメワールド　ログ・ホライズン" (in Japanese). NHK Educational TV. Retrieved September 20, 2014. ^ a b Silverman, Rebecca (November 6, 2013). "Log Horizon Episodes 1 - 6 Streaming - Review". Anime News Network. Retrieved April 9, 2014.